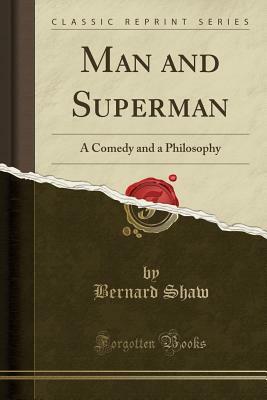 Man and Superman: A Comedy and a Philosophy is a dramatic work penned by George Bernard Shaw and originally performed at The Royal Court Theatre in London in 1905. George Bernard Shaw was a well-known Irish author, playwright and journalist. He holds the distinction of being the only individual ever to win both an Academy Award and the Nobel Prize for Literature. Man and Superman is one of his most well known dramatic works. The story is a classic 'Don Juan' story, the fictional libertine and womaniser who is the central character in many dramatic works. Told over four acts, it is the story of John Tanner, a revolutionary, and his pursuit of the beautiful Ann Whitefield. A lengthy epistle dedicatory in which the author explains the genesis of the work precedes the play. The book concludes with The Revolutionist's Handbook, presented as the work of Shaw's central character John Tanner. Man and Superman, as the subtitle suggests, is intended to be both a comedic work and a commentary on gender relations. Shaw believes that women hold more social power than men, particularly with regards to decisions of marriage. The drama itself is indeed quite comical, and it becomes clear to the reader why this work achieved a good deal of popularity in its day. George Bernard Shaw was an accomplished artist, and Man and Superman is one of his most renowned works. Fans of Shaw will certainly be pleased with this title, which can also serve as the perfect introduction to the author's works for the uninitiated.